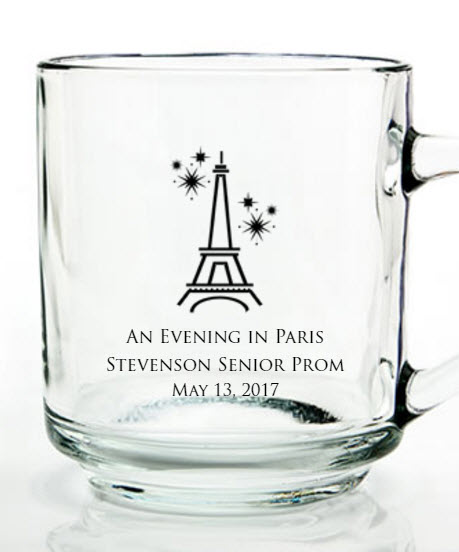 A clear glass French theme custom mug for your Paris prom favors? Oui oui! This is a creative idea, and can be created by you! Pick out the words, and a logo, and voila! 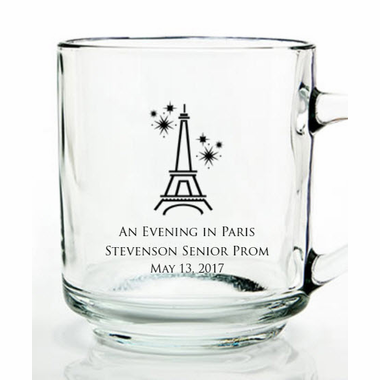 You have a perfect set of prom favors for your soiree. Love the Eiffel Tower? The Champs Elysee? Bring it all home to prom. Bon Soir mon ami. Clear classically shaped mugs measure 3 1/2" tall x 4" in diameter and have a 10 ounce capacity. They come bulk packed with the option of a box for .70 each.